Sunday August 21 1910 Did evening work and went to church Dr Clark was in the pulpit and gave us a talk about his trip to the Holy Land. Will and I had a busy afternoon getting things ready to go away tomorrow. A frightfully hot steaming day. 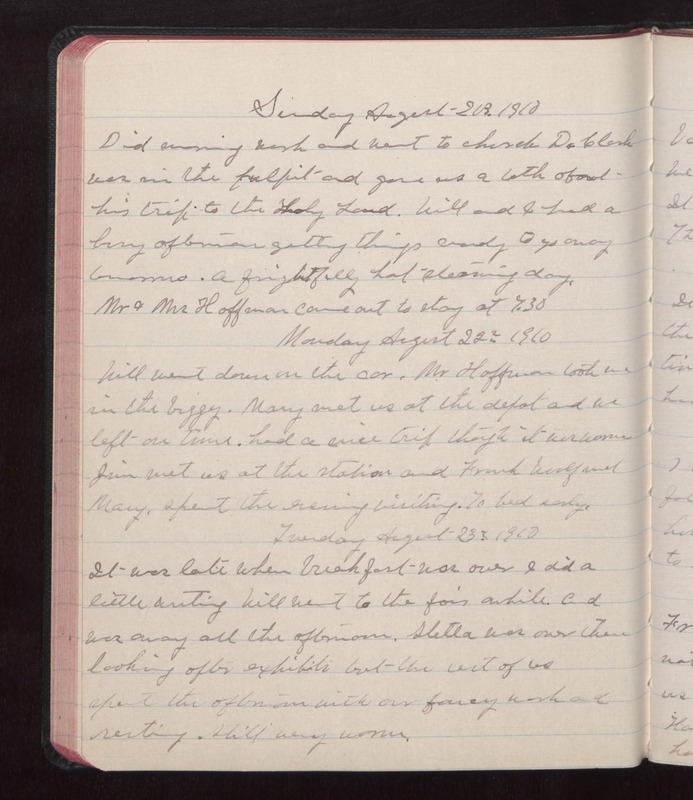 Mr & Mrs Hoffman came out to stay at 7.30 Monday August 22 1910 Will went down in the car. Mr Hoffman took me in the buggy. Mary met us at the depot and we left on time. had a nice trip though it was warm Jim met us at the station and Frank Woolf and Mary. Spent the evening visiting. To bed early. Tuesday August 1910 It was late when breakfast was over I did a little writing Will went to the fair awhile. And was away all the afternoon. Stella was over there looking after exhibits but the rest of us spent the afternoon with our fancy work and resting. Still very warm.